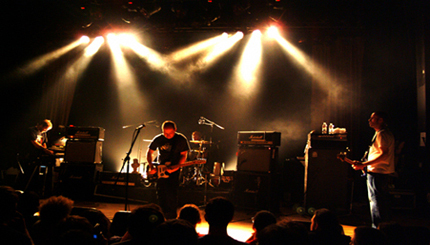 Mogwai are a Scottish post-rock band, formed in 1995 in Glasgow. The band consists of Stuart Braithwaite (electric guitar, vocals), John Cummings (electric guitar, vocals), Barry Burns (electric guitar, piano, synthesiser, vocals), Dominic Aitchison (bass guitar), and Martin Bulloch (drum kit). The band typically composes lengthy guitar-based instrumental pieces that feature dynamic contrast, melodic bass guitar lines, and heavy use of distortion and effects.